A gorgeous, fully restored stone house in an unique lakeside position with direct access to the water. 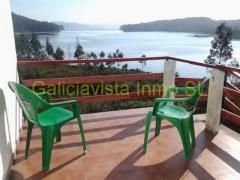 It is situated on the shores of the Embalse de Portodemouros and is 6kms from the nearest village of Vila de Cruces. The house has been very tastefully restored, using traditional materials but respecting the typical Galician style farm house but with all modern conveniences. Total area of 240 m2. The ground floor comprises a large kitchen and dining area with woodburning and butane cookers, a library, a living room with a wood burning fire, a hall, a shower-room and a conservatory with large windows allowing fabulous views of the lake. This room opens out onto a terrace. Upstairs there are 3 double bedrooms, one with en suite shower room, and another bathroom with a jacuzzi bath. Two of the bedrooms have French doors opening out onto another terrace, again with views of the lake. All ceilings are beamed with wooden beams, the middle floor is double planked, the top planking is grapia, the bedroom walls are also double planked wood with insulation in between. The windows are double-glazed cream coloured aluminium. Hot water and central heating supplied by a diesel-fired boiler. Water comes from a bore hole and there is a septic tank. Outside there is a large stone barn of 2 floors, 85 m2 each floor. The ground floor has a laundry room, a workshop, a wood store and an open area for storage or garage. The upper floor is diafanous and could be converted into further living accommodation. There is also a vine-covered patio dining area with barbeque. Seperate from the house is a large stable and outbuildings. The house is situated at the end of a country lane, so there is no traffic. The land area is 1354 m2, but in reality is much more depending on the time of year. 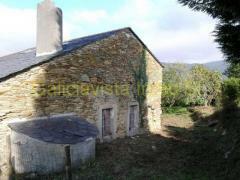 This is a wonderful opportunity to purchase an unique property in Galicia. The situation is incredible, giving peace and complete privacy. Ideal also for someone who enjoys watersports, fishing, etc. Also has huge potential as a rural holiday rental. For Sale: Beautiful rustic stone cottage: a haven of peace near the sea.